Just now the DOW closed, closed with big gains however closed this quarter on a losing streak. As some of you know, I analyse and trade DOW more than any other market. Let’s get into business. Am going to keep this post a bit longer. As we move towards a longer weekend, let us do the analysis bit deeper. Am going to take you through how a real analyst go through a chart with minute observations to arrive at some conclusion. It would be boring for some who doesn’t want to learn how to make money. It’s going to interesting for those who want to understand how a technical analyst observes a chart. Firstly, let us pull up the longer term picture of Nifty – the monthly chart. 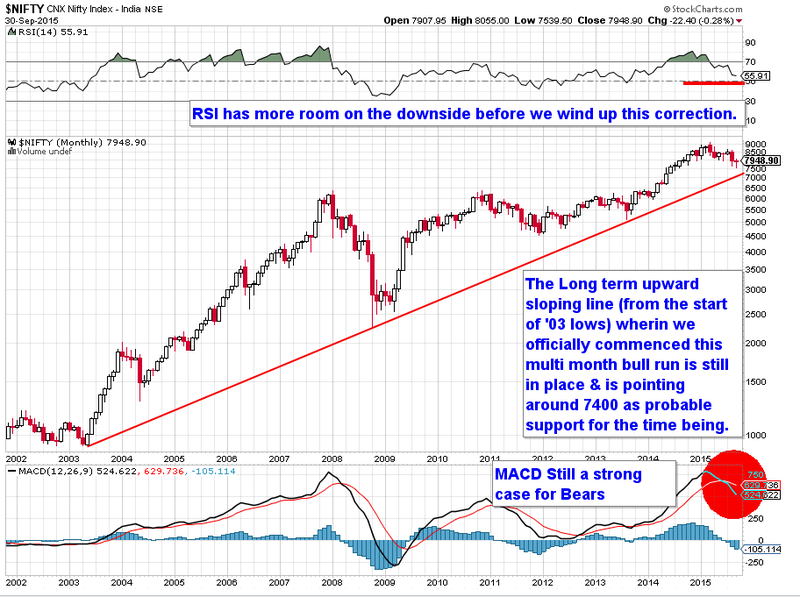 We can easily identify the long term upward sloping trend-line still in place. This indicates Nifty has more room on the downside and currently we are heading towards 7400 mark if we have to believe this long term trend-line is to hold. If we drag in terms of time correction, we might see this 7400 mark moving towards 7450 or 7500, let us not speculate right now on where this correction could end up. Now let us move to intermediate view on Nifty. Let’s pull the weekly chart. The zig zag zone that we believed till yesterday was a rectangle, you can find it in the posts below. Now observing this chart closely, we find it to be a perfect flag pattern in formation. RSI still has more room before turning down from in between 50 and 55 mark. Let us zoom this picture closely as to understand when will this zig zag zone comes to an end. Looking at the daily chart for a closer observation. Now this gives us few cues. we are heading towards an end of this zig zag zone. Once we hit around 8040, most likely today we might end up this zig zag moves. Even though we still have a probability where in Nifty move towards 7750 and hit back 8000 once again to stay in zig zag zone for quiet sometime, however the reason why I say we are ending up is by looking at the VIX chart which is posted at the end of this post. 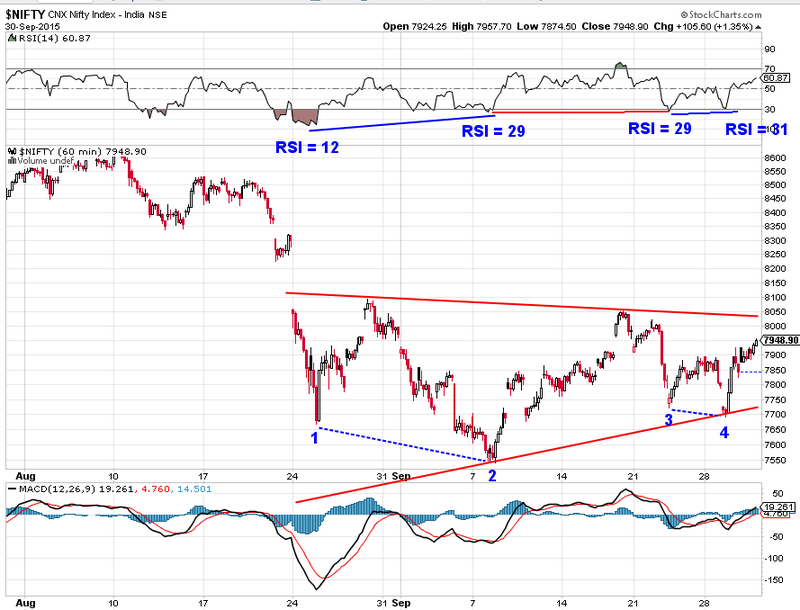 RSI has some more room on the upside wherein it can turn down in between 50-55 mark. 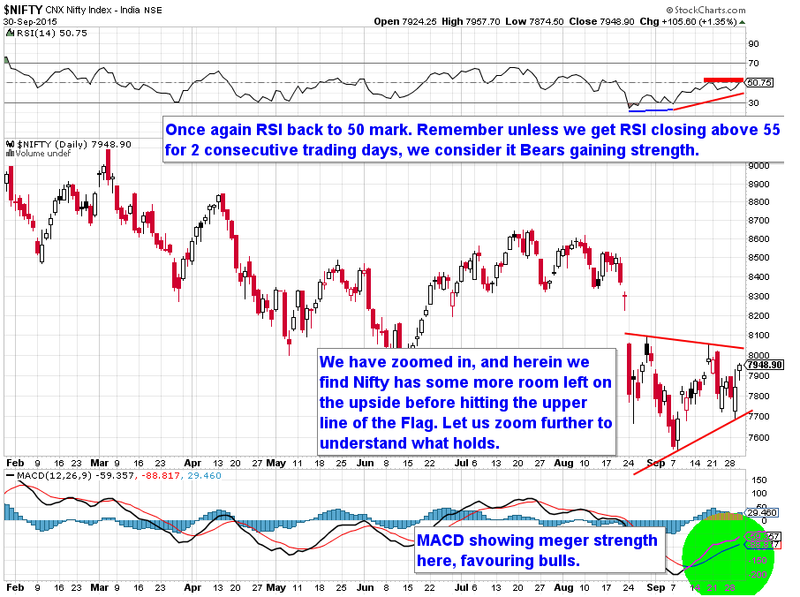 We always consider 50-55 mark zone in RSI chart as a completion of the pullback rallies. This zone gives the main trend more inherent strength to push prices lower. Now the question comes, if we are heading towards the close of zig zag zone; what next. Is it on the upside or downside. Can you see something different on the RSI chart? This holds the answer to our question. Let us dig the chart further down trying to answer our question. Pulling up the hourly chart. We can now clearly see the zig zag zone (flag) on zoomed version. 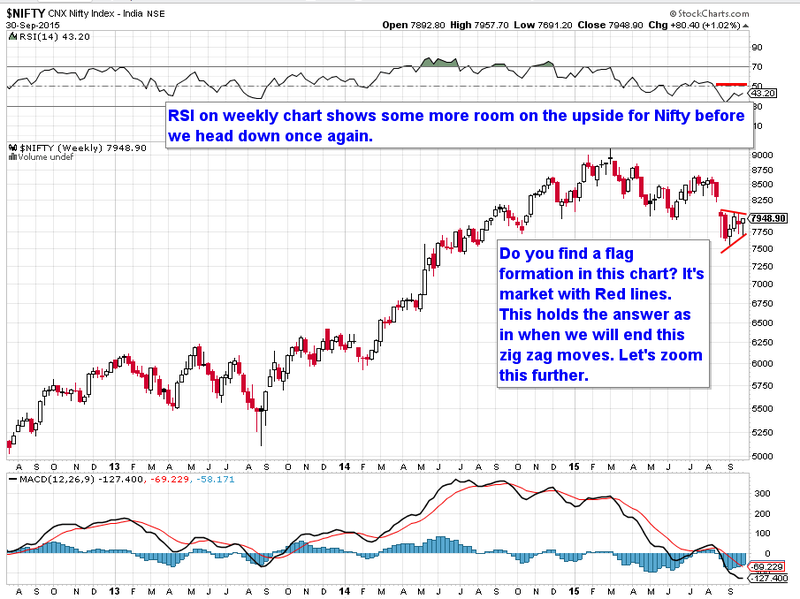 Now as we discussed earlier RSI on the daily chart hold the answer and this is why we have zoomed in. I have marked 4 points on the price chart. Three different lines have also been marked on the RSI indicator. Let us understand if there was any positive instances in the chart to indicate the next move up. When RSI moved from 12 to 29 on the RSI chart, prices did actually moved lower indicating that this move do qualify for a positive divergence, however did not sustain the next few moves. When RSI moved from 29 went all the way to 73 and moved back to 29, prices actually moved up; however it does not qualify for a positive divergence as RSI chart did not have divergence except for a double bottom. When RSI moved from 29 to 31, prices again moved lower indicating another possible positive divergence which could pull back the nifty out of the zig zag zone, but fails to sustain the momentum (reading it along with MACD). This shows though prices were hurrily moving up, it did not move on the basis of inherent strength of Bulls rather it moved up because Bears stayed away just to gain more strength to push prices lower once zig zag zone ends. 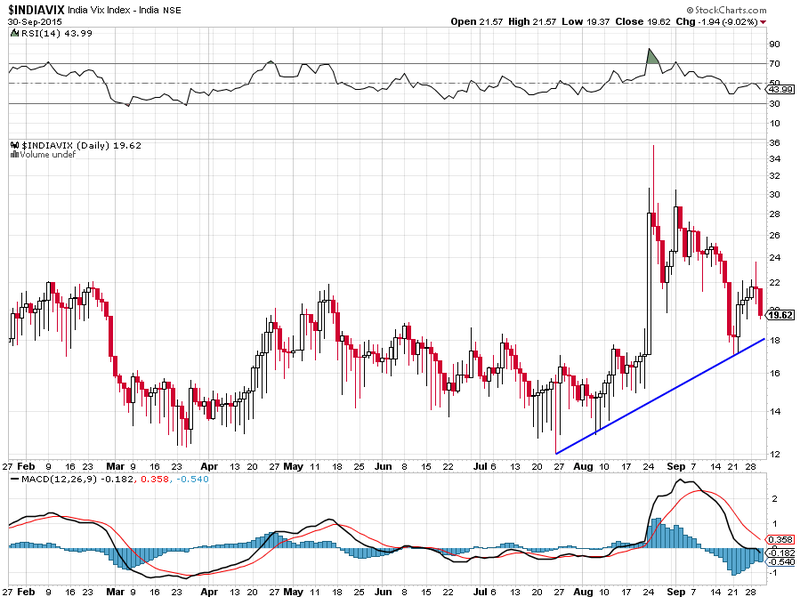 Finally let us pull India VIX (Volatility Index) chart. This will give us cues as in are we going to see an end to this zig zag zone in next two trading session or not. I have always observed, there is a negative correlation (most of the time) between price chart and VIX chart. So let us try to understand. Looking at the chart we see an upward sloping line which acts as a trigger to plug in volatility in the markets. To be exact right now it hovers around VIX-18 and once this 18 mark is touched we might see another round of volatility creeping into the market, moving towards 40 mark which means (negative correlation) nifty moving towards 7400 mark. Conclusion: Today watch out for Nifty @ 8040 + India VIX @ 18. If this combination happens either today or Monday, we might see the next round of selling coming in. Alternative view: If we close above 8050 or India VIX closes below 18, we might see the gap @ 8360 filled up before we head down. Why am I saying this alternate view is simple? We are in a correction zone and always Mr. Market loves to play fool around bulls and the bears. Caveat: It’s only Mr. Market who is always right, not the Bulls, nor the Bears or the analysts. Mr. Market rewards only those who understands this and who follows him rather than trying to beat him. Good Analysis... Can You Share Sector Which Looks Good & Bad Going Frwd.. Yes. Will definitely do that going forward. Can u pls. give ur contact details for study. What next for Bank Nifty? Will this rally fill the gaps?